Fun for the whole family Party Games for All Ages on Durable Cardstock 5"x7"
24 Unique Bingo Card activities and Separate Page with Bingo "Ball" Cutouts. Great from learning about the bible in a fun interactive way for children. Add fun festive bingo markers and prizes to complement this biblical childrens game. Your Sunday school class at church will have a blast playing bingo together! 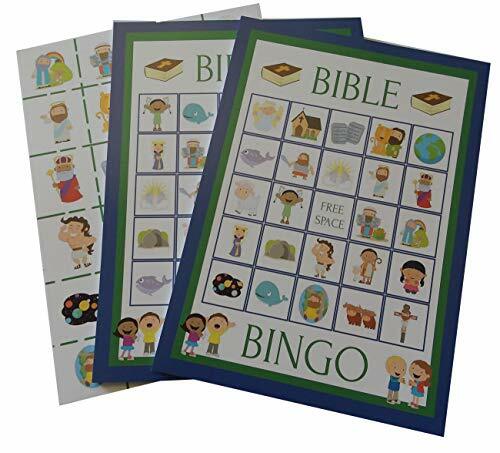 Perfect for kids or adults, these bingo cards are designed with cute Bible artwork featuring Jesus, Noah, Goliath, Samson, Daniel and more!